Concrete damage is caused by a lot of things. It could be defects that root back to improper pouring or subgrade preparation, something related to deterioration from old age, or somewhere in between. The result can be something as ugly as cracks, holes, or spalling or something superficial as unpleasant stains and concrete discoloration. Whatever the issue, a reliable fix must be applied to keep the damage from getting worse. In the past, concrete removal and a replacement was the only reliable solution. Fortunately, that has been changed, thanks to innovative pool deck, driveway, garage floor and patio repair and refinishing options in the remodeling industry. There is a wide array of decorative concrete applications that can repair and remediate issues, all meeting industry standards, and providing appealing results at affordable rates. These provide efficient fixes without scarring and the results are long-lasting. Sustainability – Nowadays, greener solutions are trending so much that people are really opting for more eco-friendly options. Concrete pool deck repair in Indianapolis, IN reduces the carbon footprint caused by cement production. Time-Saving – The amount of time needed to complete a repair project is almost equal to the amount of time needed to just remove an old concrete flooring. So, imagine how much longer it would take to repour and cure. Design Options – There is a wide range of design and color options available for concrete resurfacing or refinishing slabs. Ways to Repair Concrete Pool Decks, Patios, Driveways, and more. Resurfacing – This is the process of giving an old slab a new surface. The old slab is retained, topped off with an overlay or coating, and then customized to the property owner’s preferences. The most popular resurfacing methods are stamped overlay, spray texture, and epoxy flooring. Refinishing – For slabs with zero surface damage, changing the finish or adding one can immediately boost its appeal and extend its lifespan. Popular refinishing applications are concrete staining and resealing. Call at (317) 854-4529 to learn more about concrete repair options to suit your desired design. 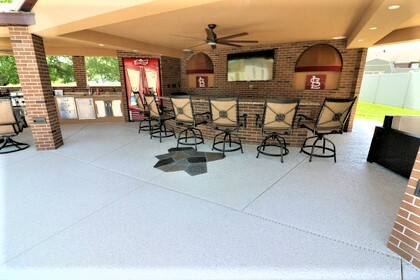 Indianapolis Concrete Artisans is a decorative concrete company that provides repair solutions that combine form and function on patios, pool decks, driveways, and more. Indianapolis concrete repair contractor has highly trained team that values attention to detail and effective customer communication. We partner with our customers so that we could help them re-imagine and reshape their concrete surfaces to create better-looking and functional spaces. Call or email us today. From style options to concerns about budget, let us assist you through a free consultation. We also give free quotes.